Intel has finished designing microcode update patches for its processors. On April 2nd, 2018, they announced that processors that have not yet been patches will never be patched. Their full statement is available in this PDF document. In that document, Intel specifies which of their many processors do have patches and which of their more recent processors will never receive updated firmware. 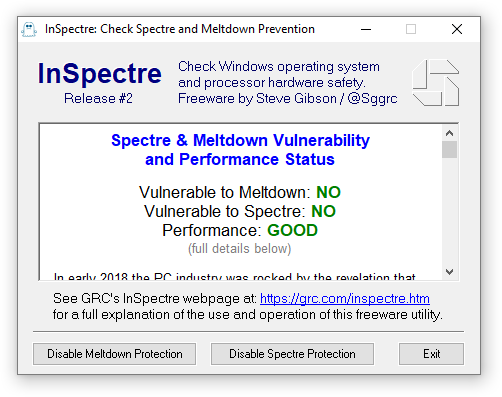 Now that the industry has this information, this 8th release of InSpectre incorporates that list of CPUIDs and displays whether microcode firmware updates exist for the system's Intel CPU. 973 3,040 Gibson Research Corporation <img src="http://www.oldergeeks.com/downloads/gallery/thumbs/InSpectre1_th.png"border="0"> Apr 13, 2018 - 11:10 v8 125.1KB EXE , out of 20 Votes.